In a widely publicized study earlier this year, scientists reported that people who sit for long periods every day have a higher risk of dying from all causes than people who stay active. Very sedentary people, even those who do some regular exercise, have higher death rates from heart disease, cancer, Type 2 diabetes, and dementia, to name just a few. Chances are good that you, whether you are an employee or the employer, are in this at-risk category, since 50% to 70% of Americans spend at least 6 hours a day sitting. For office workers, this is particularly challenging because the traditional office is designed around sitting at a desk. Exercise ball. That big oversize ball from the gym can give you a workout while you work. Staying balanced on the ball keeps your core, abs and lower back muscles active all the time. You can use a standard exercise ball, or upgrade to ball chairs that have bases and backrests. Active stool. The active stool usually rests on a central support with a seat that can move in any direction. 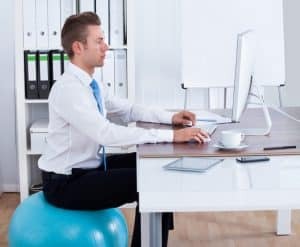 Like the exercise ball, it forces you to sit actively and balance with your feet. Saddle stool. This stool opens your hips and drops your thighs as you straddle it like a saddle, encouraging better posture and core muscle use. Stand-up stool. A stand-up stool has a cushion to lean your hips on as you work standing up. This takes some of the weight off your feet and gives you a change of position. Kneeling chair. The kneeling chair is more of a posture correction than a genuine sitting alternative, as it distributes your weight between your hips and shins, and aligns your lower back more correctly. However, it does gives your abdominal muscles more exercise than a traditional chair. Standing desk. A standing desk takes sitting out of the equation entirely by putting your whole work area at standing height. As an added benefit, many people find that they are more energized, concentrate better, and are more productive when they work standing up. Treadmill desk. The ultimate anti-sitting workstation incorporates a walking treadmill that keeps you not just standing, but strolling through your day’s activities. Get up, stretch and move around for several minutes every half hour. Many apps are available to remind office workers to take a break. Pick one for yourself, or encourage your employees to get one and use it. Have walking meetings. Instead of sitting while you’re on the phone or having a conversation with a fellow worker, take a walk while you talk. Get a pedometer or activity monitor. Counting your steps and calories burned every day starts a natural competition with yourself to boost that count every day. You can even start friendly office competitions to encourage more activity. Keeping yourself active can help reduce stress and improve your overall health. Helping your employees keep active can improve their productivity, reduce both absenteeism and turnover, and make your business a better place for everyone to work. Rob Levine & Associates specializes in Personal Injury throughout Rhode Island, Connecticut and Massachusetts, as well as Social Security Disability and Veterans Benefits throughout the country. As “The Heavy Hitter ®” Rob Levine not only works hard on your case, but also believes in making a positive impact in the communities he serves. Through internal resources, education and volunteerism, Rob Levine & Associates strives to help prevent accidents, as well as raise awareness around the needs of our elderly and returning Veterans. For more information visit www.roblevine.com , call 401.529.1222 or toll free at 888-533-7507.